Far from the "realistic"Ghostbusters game Terminal Reality is creating for the Xbox 360 and PlayStation 3, let's take a look at what Nintendo Wii and DS players have to look forward to. 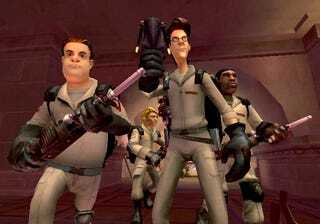 I kind of like what developer Red Fly Studio has done for the Ghostbusters games for the Wii and PlayStation 2. Rather than giving us a watered-down version of the visuals we'll be seeing on the more powerful consoles, they went for a more animated style, freeing themselves from having to worry about how hard they are pushing the two weaker systems. Zen Studios looks to be using the same animated style for their Nintendo DS version as well, which suits the double-screened handheld just fine. Should be plenty of Ghostbusters to go around once the game is released in June.